2007 Soft SBP has developed a new concept of aneuploidy prenatal screening software “Online” especially targeted to multi-center facilities with large number of patients. 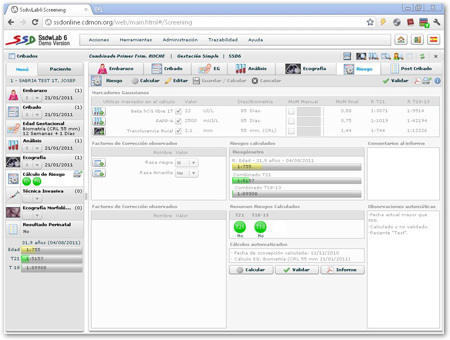 The modern technology used in this version, allows operation on the internet and local networks with an almost unlimited number of users and institutions working concurrently on a single installation as well as task automation from other IT systems and total connectivity with external laboratory devices, ultrasound equipment, etc. ¿How to make a combined first trimester screening with SsdwLab6? A practical example of how to perform a first trimester combined screening for prenatal aneuploidy detection with SsdwLab 6 software. An example of running Ssdwlab6 Quality Controls in prenatal aneuploidy screening. Example of running some Automatic calculations in SsdwLab 6: Medians, weight Corrections,Tobacco, etc..